These are Megasumer’s 4th generation “Inflatable Army” lightweight “party weight” inflatable sabers which are great for give aways, and light play. Go with Megasumer’s “Premium” inflatable sabers if you would like something more substantial. This 4th generation party weight design is longer, made from heavier gauge material than prior designs, and we’ve implemented improved quality checks. Make sure the seller you’re buying from is “Megasumer”, or you will not receive this exact product. 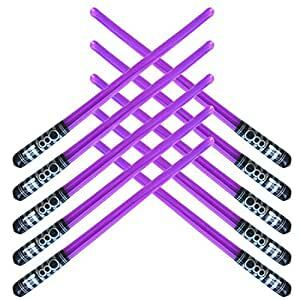 * 8 Purple swords total * Great for play. * From Megasumer’s Inflatable Army product line. * Swords measure approximately 31″ long each. * Blades are transparent and do not light up.